Flying carpets and magic lamps . . . flashing scimitars and scheming viziers . . . crusaders, Mongols and Bedouin . 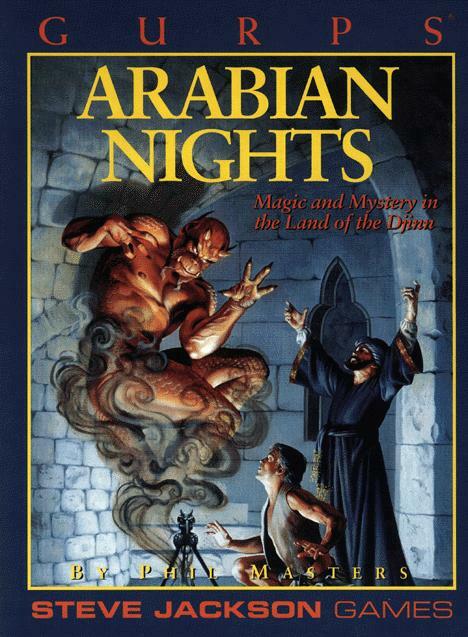 . . sultans, poets, merchants and the original Assassins – all this and more can be found in GURPS Arabian Nights. Play a merchant, mercenary or dervish in the burgeoning Islamic civlization, as the Arabs spread across Persia and Africa to the very gates of Europe. Confront the terrible shapeshifting djinni, creatures of smokeless fire. Battle them for glory and remembrance . . . and an irresistible black sword. Cast spells that move mountains and tame fantastic beasts – or use wits and stealth to defeat evil wizards. Voyage like Sinbad – or ride with Marco Polo – in search of Chinese silk, exotic Indian blades and wild foreign magic. Fight in the Crusades, when Christendom sought to free the Holy Lands – and Islam held off the Frankish invasion. Battle alongside brave Mamelukes, Turkish slave soldiers of Egypt. Dream of "a rose-red city, half as old as time" – then go there, and learn what kismet, destiny, has in store for you. Inside this fascinating book are descriptions of the world of the Arabian Nights, its tumultuous history, the religions that define its culture, character development, beasts of fact and fantasy, outlandish magic and unique campaign ideas. There are a thousand and one journeys in GURPS Arabian Nights! Pyramid #3/93: Cops and Lawyers gives a look at the legal system of the classical Islamic world.